The micro-scale machining of titanium alloy has many problems such as severe tool wear, low machining efficiency, and poor machined surface quality. This paper presented a novel processing method of laser-induced oxidation assisted micro milling (LOMM). The morphology and phase compositions of the surface layer and subsurface layer under laser irradiation, as well as the morphology of the machined microgroove, were investigated. The effects of micro milling parameters on cutting force, surface roughness, and top burr width were studied in detail. The burr formation mechanisms and tool wear mechanisms were revealed. 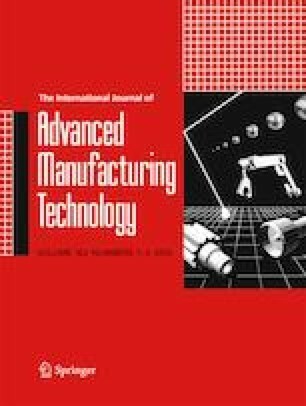 A comparison study of LOMM and conventional micro milling in terms of cutting force, machined surface quality, and tool wear was conducted. A porous oxide surface layer and relatively dense subsurface layer were formed under laser irradiation. The cutting force and tool wear in removing the oxide surface layer was extremely low compared with those in removing the substrate material. Feed per tooth had a significant effect on the cutting force, surface roughness, and top burr width. For the investigated range of parameters, the optimal feed per tooth and cutting depth were 3.5 μm/z and 6 μm, respectively. The tool wear mechanisms in LOMM were coating spalling, and in conventional micro milling were tool nose breakage, coating spalling and adhesive wear. Under the same cutting parameters and cutting length, LOMM effectively decreased the cutting force, slowed the tool wear, and prolonged the service life of tool. Hongjun Xia and Guolong Zhao contributed equally to this work and should be considered as co-first authors. The authors are grateful to Mr. Aqib M. Khan (senior researcher) and Dr. Asif Iqbal from University Brunei Darussalam for the great help with improvement of the English language and grammar. This work is financially supported by the National Natural Science Foundation of China (No. 51575268 & 51705249), the Natural Science Foundation of Jiangsu Province (No. BK20160792), the Fundamental Research Funds for the Central Universities (No. 30917014101), and the Aeronautical Science Foundation of China (No. 2017ZE52047).